Ferry Fare: Malta/Gozo/Malta ferry fare for adults and children (5 to 12 years) is included in the price. We transfer to the Cirkewwa terminal located in the north of Malta to board our ferry for a short ferry crossing to the island of Gozo. During the crossing you will pass the smaller island of Comino and you will notice a top of the high rugged cliffs stands the Santa Maria Fort which was used during the movie 'Count of Monte Cristo' (filmed 2002). Our ferry lasts only 25 minutes and on arrival we join the guide and tour transport for our tour of Gozo. You will immediately notice that Gozo is much greener and has certain characteristics making it different to the larger of island of Malta. We start our tour with a visit to the ancient temples of Ggantija. Ggantija Temples (a UNESCO World Heritage site) are 5500 years old, making them some of the oldest free standing structures in the world. Our guide will unfold the history related to these 'giant towers' erected during the golden neolithic period (c. 3600–2500 BCE). We next proceed to the pretty bay of Marsalforn and here you will board a trackless train which will take you on a fabulous trip where you will discover some of Gozo's natural sites.You will travel on the smooth plateau from where you can admire ancient salt pans and beautiful natural bays of Xwejni and Qbajjar, not accessible by large coaches. This unique way of touring is exclusive to this tour and so not to be missed. We rejoin our coach and continue to our next stop at the Ta’ Dbiegi Crafts Village, this short stop is ideal if you want to pick up a souvenir. 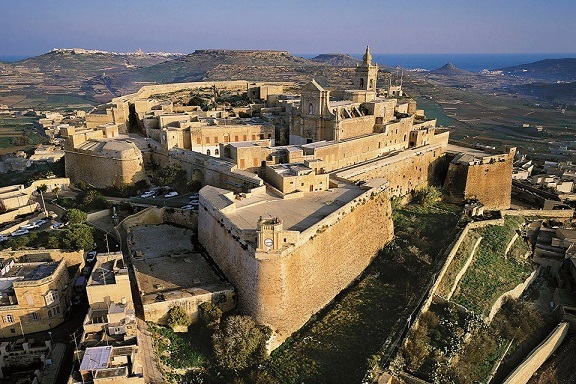 Here you can view local handmade pottery, mouth blown glass, Gozo lace and silver filigree. We continue to our next stop and the area known as 'Dewjra'. Here you will see three interesting geological sites including Dwejra Bay and the Inland Sea which is a lagoon of seawater which has access to the open sea though a small arch like tunnel. You can take a small boat trip around the inland sea and through the tunnel (cost of boat trip is not included in the tour rate, allow €4 per person if you would like to do this and if time allows). Another of Dwejra's geological delights is the Admiral's Rock or as it is better know, Fungus Rock. A special plant is said to grow here which has various medical cures for conditions such as dysentery, bleeding and impotence. 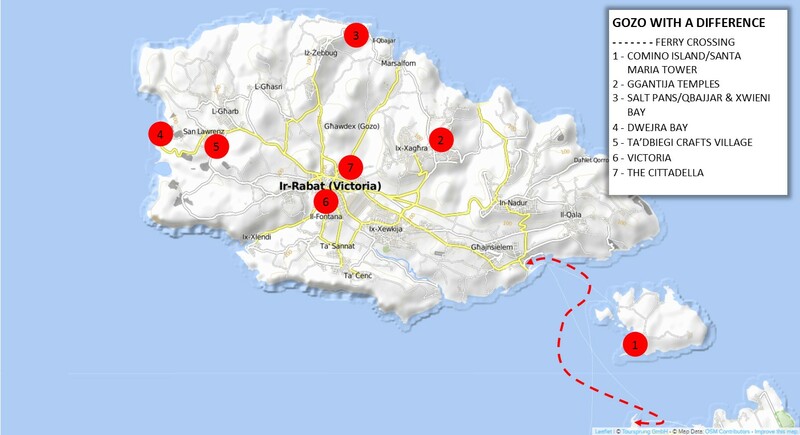 Our final stop is to Victoria, the island capital and the crossroads of Gozo..meaning all main roads pass through Victoria. Victoria is also locally know as Rabat, in fact locals still call it that. Here you will have time to explore the ancient Cittadella an ancient fortified city located at the heart of Victoria. The Cittadellla is a small walled city, only a small number of families still live within the walls. This historical fortified city has recently undergone major restoration works and you can visit the new visitors centre, explore quaint alleys or stroll around the walls enjoying amazing views of the island from the high bastions. We end our memorable day of adventures with dinner in Victoria. After dinner and as the sun starts its descent we make our way back to the ferry for our return to Malta and transport you back to the drop off point. Not a good tour. Guide was totally disinterested and grouchy. The visit to see handicrafts--was to a very crowded commercial store. We did not see any of the lovely churches on the island. The Gigantija was worth seeing which was my main reason for booking the tour. Really good tour. Gozo is beautiful, like a dream Island. The tour guide and drivers are so nice and knowledgeable. Would love to do this again. Loved it. Good view from different angles.